Can you imagine getting the best from both worlds? Plenty of power and superior speed. That’d be wonderful, wouldn’t it? Add proper control and maneuverability and you got yourself a wonderful racquet. And you can get all of that thanks to the Yonex Duora 10. Offering a real breakthrough in rackets it comes with an aero frame and box frame, for the best performance in power and speed. This racket has plenty of potential and many advantages to offer you. Want to discover them? Then just keep reading. 1 Pros and Cons: What Is In Store For You? Pros and Cons: What Is In Store For You? Aerodynamic and fast. Its design allows you to cut easily and fast through air. An amazing blend of tech. It’s packed with the best technology by Yonex. Excellent power. The smashes and shots in general are very powerful. This two-face racket incorporates the best technology by Yonex, which brings you a superior performance in every single sense. From speed to power, this racquet is an excellent choice. Want to know more? Then just keep reading this review so you can know more about this awesome racket. The design is modern. It’s a black racket with green and orange stripes in the shaft and frame. I must add that the logo looks quite awesome. 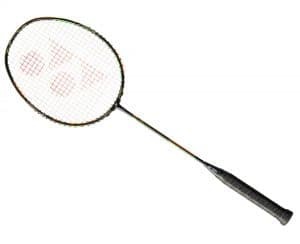 This racket has two frame sides which allow you to hit harder and cut faster through air respectively. The backhand is the epitome of speed and aerodynamics, while the forehand is the source of power for this racket. The Dual Optimum System allow you to hit harder with the forehand and enjoy of more speed with the backhand. That’s why it’s a wonderful choice for both attackers and defenders. This comes along with the new grommet pattern, which brings you more grommet holes for a better performance. It’s the same pattern used in the Nanoray 900. Let’s not forget about the Aero + Box Frame technology. This along with the Dual Optimum System will help you to achieve a harder hitting and faster swings without problems. The solid-feel core reduces torque. This translate in more control and confidence at the hour of playing. You have that the frame is designed with an isometric shape, which allows you to hit more successful shots and even hit off-centered shots with great success rate. You can really feel the difference between both sides of the frame. It takes some time to get used to it, that’s why it’s only good for advanced players with great coordination. And let’s not forget about the Nanometric DR technology. This revolutionary material brings you a higher repulsion speed (+9%), a great shuttle hold (+3%) and overall more power and speed. It’s a super slim shaft, which is the slimmest ever created by Yonex till date. This allows you to enjoy of lesser air resistance, and therefore, more speed and momentum. The shaft is constructed with Nanometric technology, which increases bonding forces between carbon fibres, which translates into greater speed and more powerful shots. The built-in T-joint improves shock absorption and eliminates trembling. This will allow you to maneuver your racket with more versatility and control. Finally, you get a support cap that provides you amazing maneuverability, solid gripping and excellent control. Without any doubts it’s one of the best rackets, and some may dare to say, the word best badminton racket. And now it’s time to review its performance in the game. When serving you should use the forehand, because this will allow you to send the shuttle further. Although, you can achieve a similar result with the backhand if you have enough strength. Forehand clears are so effortless you won’t believe it. It is very similar to the Voltric Z Force II or Voltric 80 in this regard, because the clears are effortless and go very far. Another aspect where the forehand side shines. Thanks to the great technology it contains you can hit the shuttle as hard you want and land it with amazing precision. If you are a fan of smashes, then you are going to love it. You can enjoy the wonders of excellent drives in the offensive and defensive department. Backhand drives feel pretty good thanks to the fast reactions and outstanding maneuverability. Blocking smashes and drop shots with this racket is excellent, because it really brings you control and enough power to get out of the danger zone. And finally, it has an outstanding performance in the front-court. The net kills will be nearly unstoppable and defending yourself from aggressive shots won’t be an issue thanks to the fast reactions and features of the backhand side. As you can see the two sides of this racket are truly worth it and are not just marketing hype. This racket is amazing and you should get it if you want the best from both worlds: Outstanding power and lighting speed.